Brunei Darussalam, (pronounced /bruːˈnaɪ/ in English) officially the State of Brunei, Abode of Peace (Malay: Negara Brunei Darussalam, Jawi: برني دارالسلام), is a country located on the north coast of the island of Borneo, in Southeast Asia. Apart from its coastline with the South China Sea it is completely surrounded by the state of Sarawak, Malaysia, and in fact it is separated into two parts by Limbang, which is part of Sarawak. Brunei, the remnant of a very powerful sultanate, regained its independence from the United Kingdom on 1 January 1984. 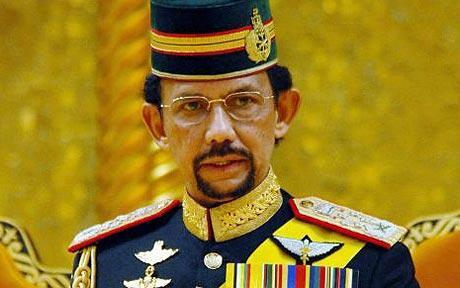 Hassanal Bolkiah, Sultan of Brunei. The Sultanate of Brunei was founded when Sharif Ali of Hejadz married the local Brunei princess. He brought Islam and founded many mosques in Brunei. Sultan Hassanal Bolkiah of Brunei, whose title has passed within the same dynasty since the fifteenth century, is the head of state and head of government in Brunei. The Sultan is advised by several councils and a cabinet of ministers although he is effectively the supreme ruler. The media is extremely pro-government and the Royal family retains a venerated status within the country. Brunei is an absolute monarchy and the sultan has absolute power. There is no elected legislative body. In September 2004, the Sultan convened an appointed Parliament which had not met since independence in 1984, although it lacks any capacity beyond advising the monarch. Brunei is a member of the United Nations, Commonwealth of Nations, ASEAN, APEC and Organization of the Islamic Conference. Brunei ensures that all citizens have access to free health care, provided via a group of public hospitals. The largest hospital in Brunei is Raja Isteri Pengiran Anak Saleha Hospital, also known as RIPAS Hospital. There is also a private medical sector, Jerudong Park Medical Centre. As of 2008, no hospitals in Brunei were undergoing international healthcare accreditation. There is currently no medical school in Brunei, and Bruneians wishing to study to become doctors have to attend universities overseas. This situation may be changing. Also, to ensure the public's access to medical care, qualified doctors from overseas are imported into the country. A School of Nursing was founded in 1951. • such, Labour Department continues to allow skilled as well as unskilled foreign workers to work in Brunei, notably in the construction and service-related sector. • As most of the citizens are employed in the public sector, it continues to promote and ensure more local employments in the private sector.